Orion Pharma Welfare Trust has published an Scholarship Circular - Orion Pharma Medical Scholarship for Medical Students who are admitted in different govt. medical colleges in this year. If You have any Question. Like this FB Page and message us. The circular has been published in many daily newspapers of country. This scholarship is really a good decision of Orion Pharma Ltd's Welfare Trust. Details of the scholarship has been given in the circular's picture below. 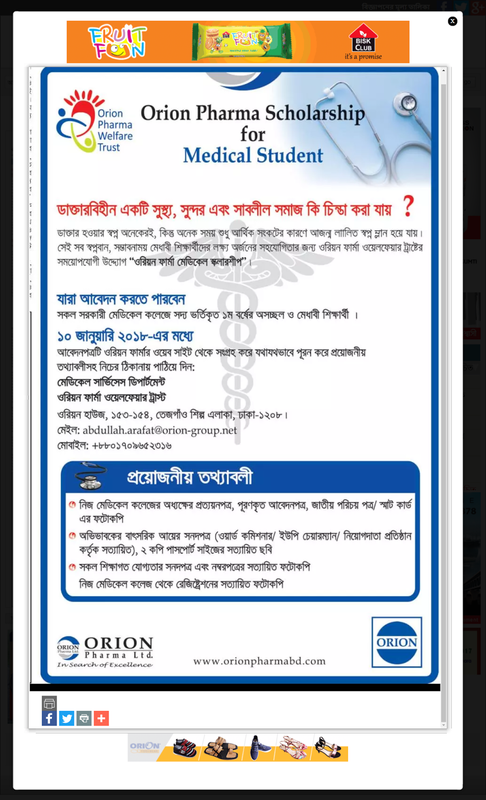 Apply Now Orion Pharma Medical Scholarship Now. 1. Students who are admitted in different Govt. medical colleges in BD. 2. Students should be very poor. 3. Students should download and fill up the application form which you can find in this link. Now see the scholarship circular here. Last Date: 10 Jan, 2018.